Whenever you make an investment in natural stone flooring, such as limestone, it is critical in order to preserve the beauty and condition of your stone to know how to take care of it. Taking care of your limestone floors starts with sealing the stone. This is because limestone is a porous stone, making it vulnerable to stains and damage. Whenever you seal your limestone you are adding a protective, clear barrier to the surface of the stone. This will not prevent any damage to your limestone floors but it will help guard against superficial etching and staining. 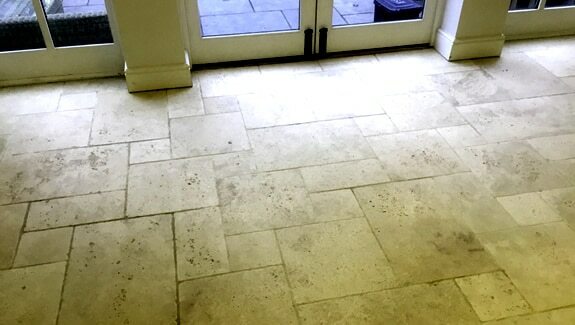 At Modern Stone Care we are the experts when it comes to sealing limestone floors in Houston. If you have limestone floors in your home or business do not hesitate to contact Modern Stone Care today! How Often Do You Have To Seal Limestone? Often times whenever someone buys a home with limestone floors, they are unsure if the floors are already sealed or if the current seal is in a solid enough condition to protect the stone. This is a reasonable curiosity as the seal on natural stone floors will not last forever. Luckily, there is a very simple test you can do on your own, at home, in order to determine if your natural stone has a strong enough seal. Second: Pour clean water onto the floor into a puddle about the size of a ping pong ball in multiple locations on the surface of your stone. Be mindful of the water on your floors, as to avoid slipping. Third: Allow the water somewhere between three to four hours to rest on the stone untouched. Fourth: Wipe the remaining water away from the surface of the stone. If you are left with a darkened patch on the stone where the water was poured, this means the water was able to penetrate your stone. If the water is able to penetrate the stone then it is time to reseal your floors. It is very important to follow step one of this test because if you neglect to clean your stone first, you are risking pushing any surface dirt or dust into your unprotected stone. If you are looking for a professional, natural stone care company that is capable of sealing your limestone floors in Houston, contact Modern Stone Care today! How Often Should I Seal My Stone Floors?